B. Jo Burns, 64, of Vienna, died Saturday morning, May 12, 2012, at 7:40 a.m. at Hillview Health Care Center in Vienna. B. Jo was born on April 6, 1948, in Carbondale, the daughter of J.T. “Tommy” Turner and Loreva Fontaine Love Turner. Survivors include her three daughters, Tricia Shelton and her husband Mike of Goreville, Trina Harner and her husband Darren of Tunnel Hill, and Tammy Weis and her husband Bryan of Omaha, Neb. ; six grandchildren, Darrick Harner, Madison Harner, Sydney Shelton, Logan Shelton, Tyler Weis and Kylie Jo Weis; a sister, Nicki Holloman of Vienna; nephews, Heath Holloman and Amy Holloman and Blaine and Tiffany Holloman; great-nieces and great-nephews, Shaela Mae Holloman, Cayden Holloman, Seth Holloman and Gabriel Holloman; and a cousin, Victor Turner of Carterville. B. Jo was preceded in death by her parents. B. Jo was a member of the Vienna High School class of 1966. She was also a graduate of Draughon’s Business College. B. Jo was employed by the Johnson County Housing Authority from 1980 until 2004, and had served as the public housing manager. B. Jo was a dedicated member of the Vienna First Baptist Church and attended as long as her health permitted her to do so. She taught in the church youth department for over 25 years. B. Jo had a deep love for and provided support and encouragement for many area youth and teenagers. She also had a deep love of music and was a member and vocalist of the church choir for many years. A celebration of B. Jo’s life will be conducted Wednesday evening, May 16, at 7 p.m. at the Vienna First Baptist Church. Visitation will be held from 5 p.m. to 7 p.m. Wednesday, May 16, at the church. A private committal service will be held at the Vienna Fraternal Cemetery. Memorials can be made to the Vienna First Baptist Church, P.O. Box 727, Vienna, Ill. 62995 or to the National Ataxia Foundation, 2600 Fernbrook Lane, Suite 119, Minneapolis, Minn. 55447. To share a memory of B. Jo or to leave an online message of condolence for her family, please visit www.baileyfh.com. 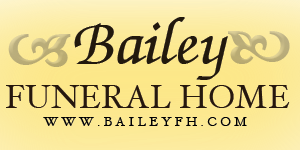 Bailey Funeral Home in Vienna is in charge of arrangements.